The Oita International Plaza offers FREE consultations for international residents of Oita Prefecture. *Interpretation into languages other than Japanese and English may be available with a reservation at least 2 days prior to the consulting day (there are no guarantees). Let’s reuse books and protect the environment! 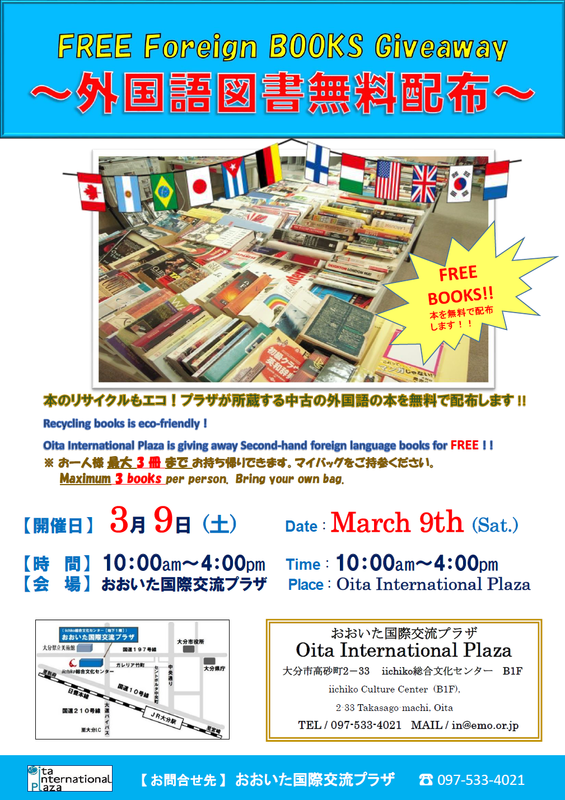 Oita International Plaza is giving away pre-loved foreign language books for FREE! *Each person may take a maximum of 3 books. Please bring your own bag. In September 2017, officials from the Oita Prefectural Art Museum attended The Best in Heritage 2017 in Croatia to represent Japanese museums. The presentation the museum gave has been uploaded to The Best in Heritage website. For more information, please see the Oita Prefectural Art Museum (OPAM) website. 03.13.2018Foreign Language Book Giveaway Activity Successfully Completed! Our Foreign Language Book Giveaway Activity was successfully completed on Mar. 10th, 2018. This time we added kids corner, providing picture books and textbooks for kids. These books were very popular among participants for the books satisfied their needs of breeding up kids in bilingual environment. The number of participants was 71, which reached the maximum of all these years. 237 books were given away during the activity, and will play important roles in participants’ study and life. Thank you very much for participating in our activity. We are looking forward to your participation next time. The Foreign Language Book Giveaway will take place again this year. 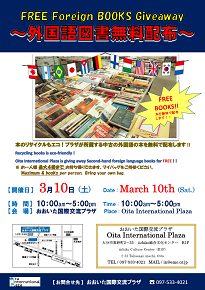 We will be giving away used foreign language books that the Plaza has for free. Notes: One person may take a maximum of four books. Please bring your own bag. The 89th edition of the Tombo is now available under the “Publication” section. The 88th edition of the Tombo is now available under the “Publication” section. We would like to announce the International Understanding Seminar ~ Islam in South-East Asia Edition. You may not be familiar with Islam, but this is an opportunity to familiarize yourself a little bit more with halal foods and more. Come learn about Islam in South-East Asia. ‘Safety tips’ provides you with Earthquake Early Warning and Tsunami Warning, as well as other useful features that can help you in the event of a disaster. Please download it if you are interested in it! !